MyMovieMonsters.com > Scary Monsters Magazine > Scary Monsters 1-100 > Scary Monsters magazine #90 - Sci-Fi Under the Microscope! 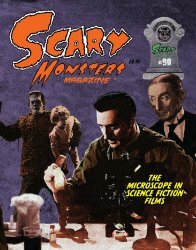 Scary Monsters magazine #90, January 2014, highlighting the Microscope in Science Fiction Films. A scare-packed 132-page issue of the 2012 Rondo Award Winner for "Best Classic Magazine." My Favorite William Castle Movies! Ansel Faraj: The Terrors of Mabuse ... and Beyond!